I had a bit of a sparkle attack today in the Garment District while shopping for mother-daughter mermaid costume fabric. (For Saturday's 30th Anniversary Coney Island Mermaid Parade, and Z's upcoming mermaid-themed 2nd birthday party). I didn't really have a firm idea for the costumes, only that the skirts should be scaly looking, and the tops should be more floaty/meshy/gauzy. So went to Spandex House and, was totally confused and overwhelmed by all the hologrammy sparkly sequiny spandex-ness of the place, and finally ended up with what you see above. The shell trims are from Pacific Trimming. Anyone have any tips on sewing with really heavy-duty hologram spandex fabric? This stuff is THICK, and every time I stretch it, the sequiny sparkly bits crack! I'm guessing serging with wooly nylon will be the way to go here once I have the skirts basted together and fitted. Once again, I think I'm just going to wing it, pattern-free! At least for the skirt--I might use one of her knit summer shirts as a rough guide for the top. So why mermaids? 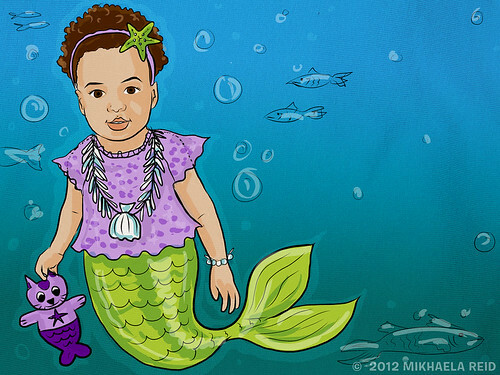 Z has been obsessed with the parade and mermaids ever since she went to a live reading by Melanie Hope Greenberg of her picture book Mermaids On Parade. I swear I'll get back to sewing something actually wearable in real life at some point, but whatever. Costumes are fun! "sparkle attack" LOL. Costumes are fantastic! I can't wait to see you as mermaids. I've never sewn anything like that fabric, but I would second the idea of using wooly nylon thread. I think your skirt plan is on target - a very good use of the mullet skirt! Who could resist a post with the title: Sparkly Spandex Shopping Spree!? This project looks like a lot of fun. I don't think I'd be the shell bra type either, lol. You girls are bound to have loads of fun on the day. What a fun project! As a mother of two boys, I've always wished I had a little girl to make these kinds of sparkly outfits for. Maybe that's why I make costumes for myself. :-) I can't wait to see how this turns out. OH PERFECT! That is JUST what I needed. What a lovely collection of fabrics! Some look like glitterdot fabrics. I recommend sewing slowly (so the needle doesn't overheat) and using sewer's ease to lubricate the needle. Have fun. Mermaid birthday party! How fun!! This will be so cute! 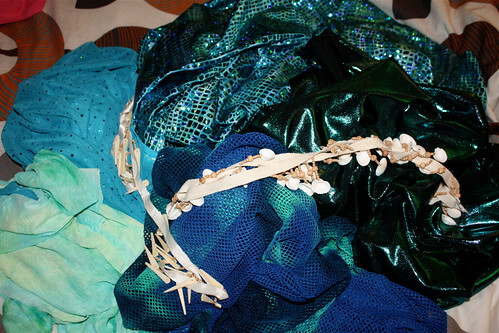 Mermaid costume sewing is AWESOME. I love your drawing of Z as a mermaid - so super adorable :) I am so excited to see all of that magnificent spandex put into action!!! Cartoon Z and her merkitty! Squee! I hope you had fun! I was hoping to make it back this year (have done it two years in the past) but my HS reunion was scheduled for the same weekend, boo.